Selection of the Greatest 19th and 20th Century Landscapes in the History of Art. La Grenouillere (1869) By Monet.  See also the Art of Painting. In the beginning, landscape painting was seen as one of the least important painting genres, and few artists paid it any attention. Only a few forward-thinking painters like Leonardo da Vinci (The Annunciation 1472), Giovanni Bellini (Ecstasy of St Francis 1480) and Giorgione (The Tempest 1508) bothered to make a special effort with the scenic backgrounds of their religious paintings. Things improved during the 16th century, as Joachim Patenier (Journey Into the Underworld 1522), Albrecht Altdorfer (Landscape with Footbridge 1520), Pieter Bruegel the Elder (Hunters in the Snow 1565) and others, began to devote entire canvases to landscape scenes. However, even these pictures are not really "landscapes" - in the sense of straightforward representations of picturesque scenes. Instead they are "narrative" works set in a scenic environment. For example, Bruegel's Hunters in the Snow depicts man as a powerless entity who is at the mercy of the natural seasons of the year. Only his faith in God gives his life meaning and comfort. Even the Danube School (1490-1540) - a group which came closest to the notion of painting a landscape for its own sake - inserted religious or mythological content into their paintings. This practice of injecting a landscape with added significance - effectively turning it into a religious or history painting - continued well into the 17th century: see, for instance, the so-called Claudean style introduced by Claude Lorrain (Landscape with the Marriage of Issac and Rebecca 1648). NOTE: The first unambiguous landscape is probably El Greco's View of Toledo (c.1595, Metropolitan Museum of Art, New York). It was left to Dutch Realist artists like Salomon van Ruysdael (1600-70), Aelbert Cuyp (1620-91), Jacob van Ruisdael (1628-82) and his pupil Meindert Hobbema (1638-1703), to create the first proper school of landscape painting, during the Golden Age of Dutch Realism (1600-80). The eighteenth century witnessed a gradual rise in demand for "landscapes" but, once again, not purely for their own sake. Jean-Antoine Watteau's Pilgrimage to Cythera (1717, Louvre, Paris), for example, was really a mythological fete galante, not a landscape. Patrons often wanted a pictorial record of their property: see, for instance, Mr and Mrs Andrews (1750) by Thomas Gainsborough; or else a precise topographical view (vedute) of cities like Venice. Specialist view-painters (vedutisti) active in Venetian painting included Canaletto (1697-1768) and Bernardo Bellotto (17201780), as well as the more Impressionistic Francesco Guardi (1712-1793) - see, for instance his View of San Giorgio Maggiore Venice (1760, Museu Calouste Gulbenkian, Lisbon). Despite the efforts of these pioneers, landscape was not considered to be a properly independent genre until about the beginning of the 19th century, a development triggered by a growing middle class taste for the picturesque, so as to escape the sights and sounds of urban life. Furthermore, reproduction through etching and engraving further extended the "reach" of these landscapes throughout the general public. So we start with the nineteenth century. English artist known for open-air pochades (oil sketches); active in France.  Normandy (1823) Tate Britain, London.  Boats off the Coast of Normandy (1823-4) Hermitage, St Petersburg. Suffolk born artist, outstanding naturalistic landscape painter.  Boatbuilding Near Flatford Mill (1815) Victoria & Albert Museum, London.  The Hay Wain (1821) National Gallery, London. A member of Dr Monro's famous circle. Specialized in watercolours.  Chirk Aqueduct (1804) Victoria & Albert Museum, London.  Greta Bridge (1805) British Museum. Founder of the Norwich School.  Moonrise on the Marshes of the Yare (1808) Tate Collection, London.  The Poringland Oak (c.1812) Tate Collection, London. For more, see: Norwich School of landscape painting (1803-1833). Painter and engraver best-loved for his panoramic Biblical landscape settings.  The Great Day of His Wrath (1853) Tate Collection London. Romantic painter, greatest English landscape artist of the 19th century.  Hannibal Crossing the Alps (1812) Tate Collection.  The Grand Canal, Venice (1835) Metropolitan Museum of Art, New York.  Burning of the House of Lords & Commons (1835) Philadelphia Art Museum.  The Fighting Temeraire (1839) National Gallery, London.  Snow Storm: Steamboat off a Harbour's Mouth (1842) Tate Collection. For more, see: English Landscape Painting (1700-1900). This artist colony specialized in landscape painting, due to Newlyn's strong natural light. Leading figures included: Walter Langley, Stanhope Forbes, Frank Bramley, and the Irish artist Norman Garstin. Contemporary of O'Conor and Osborne, member of Pont-Aven artist colony.  Sunshine, Brittany (1884) Private Collection.  Brady's Farm, Spring (1897) Private Collection. Anglo-Irish Impressionist famous for his plein air landscapes, genre paintings.  The Bridge at Grez (1883) Private Collection.  On the Loing (1884) Private Collection.  On the Road to Fontainebleau (1884) Private Collection. For more, see: Glasgow School of Painting (1880-1915). Outstanding Irish Post-Impressionist artist active in Pont-Aven and Paris.  Field of Corn, Pont Aven (1892) Ulster Museum.  Farm-at-Lezaven (1894) Private Collection.  Orchard and Mountain (1913) Irish Museum of Modern Art. Irish Impressionist and tonalist painter active in Grez-sur-Loing.  Reverie (1882) Private Collection.  Old Mill At Grez (c.1882) Hugh Lane Municipal Gallery of Modern Art, Dublin. Irish Impressionist best-known for his outdoor genre scenes.  Apple Gathering, Quimperle Brittany (1884) National Gallery of Ireland.  Feeding the Chickens (1885) Private Collection.  An October Morning (1885) Guildhall Art Gallery, London.  Zaandam (1901) Private collection, Dublin. The foremost 20th century painter of West of Ireland landscapes. 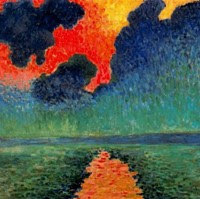  Clouds at Sunset (1910-11) Private Collection.  The Bog at Evening (1923) Private Collection.  A Connemara Village (1934) National Gallery of Ireland. Irish expressionist painter of nationalist themes, noted for his impasto.  The Ox Mountains, Ireland (1944) Pallant House Gallery.  The Night Has Gone (1947) Private Collection.  For the Road (1951) National Gallery of Ireland. For more, see: Irish Landscape Artists (c.1800-2000). Romantic French painter, member of the Barbizon School.  Souvenir of Mortefontaine (1864) Louvre, Paris.  Ville d'Avray (c.1867) Brooklyn Museum of Art, New York. Outstanding Barbizon painter noted for his delicate hatching in pure colour.  The River Seine at Mantes (1850) Brooklyn Museum, New York.  River Bank (1866) The Hermitage, St. Petersburg. Devout French painter of peasants at work, member of the Barbizon School.  The Gleaners (1857) Musee d'Orsay.  Man with a Hoe (1862) J. Paul Getty Museum, LA.  The Goose Girl (1863) Walters Art Gallery, Baltimore. Influential landscape artist; known for his naturalism and plein-air painting.  Under the Birches, Evening (1844) Toledo Museum of Art, Ohio.  Edge of the Forest at Fontainebleau, Setting Sun (1850) Louvre, Paris.  Forest of Fontainebleau (1867) Bordeaux Museum of Fine Arts. For more, see: Barbizon School of Landscape Painting (1830-75). Impressionist painter who encouraged Monet to take up plein-air painting.  On the Beach, Trouville (1863) Musee d'Orsay. Impressionist, classicist, his work looked forward to abstract art and backwards to the Italian Renaissance.  House of the Hanged Man (1873) Musee d'Orsay.  The Bridge at Maincy (1879) Musee d'Orsay.  Lac d'Annecy (1896) Courtauld Institute Galleries.  Mont Sainte-Victoire paintings (1882-1906) Various art museums.  Blue Landscape (1904-6) Hermitage, St Petersburg. Foremost exponent of spontaneous plein-air Impressionism.  The Beach at Trouville (1870) Wadsworth Atheneum.  The Thames Below Westminster (1871) National Gallery, London.  The Seine at Bougival (1872) Private Collection.  Impression, Sunrise (1873) Musee Marmottan Monet, Paris.  Poppy Field, Argenteuil (1873) Musee d'Orsay.  Boulevard Pontoise at Argenteuil, Snow (1875) Kunstmuseum, Basel.  Poplars near Argenteuil (1875) Museum of Fine Arts, Boston.  Gare St Lazare, Paris (1877) Musee d'Orsay, Paris.  Monet's Garden at Vetheuil (1881) National Gallery of Art, Washington DC.  Rouen Cathedral paintings (1892-4) Various art museums.  The Seine at Giverny, Morning Mists (1897) North Carolina Museum of Art.  Water Lilies series (Nymphéas) (1897-1926) various art museums.  The Water Lily Pond: Green Harmony (1899) Musee d'Orsay. See also: Legacy of Claude Monet's Impressionism. 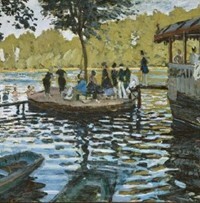 Like Monet and Sisley, he was most interested in plein-air painting.  Foxhill, Upper Norwood (1870) National Gallery, London.  The Red Roofs (1877) Musee d'Orsay, Paris.  Boulevard Montmartre paintings (1897-8) Various art museums. For more, see: Characteristics of Impressionist Painting 1870-1910. French Impressionist; famous for his "dappled light", portraits, female nudes.  La Grenouillere (1869) Oskar Reinhart Foundation, Winterthur.  Path Leading Through Tall Grass (1877) Musee d'Orsay, Paris. For more, see: Best Impressionist Paintings (c.1870-1900). Anglo-French painter; one of the greatest Impressionist landscape painters.  Chemin de la Machine, Louveciennes (1873) Musee d'Orsay.  Misty Morning (1874) Musee d'Orsay.  Snow at Louveciennes (1878) Musee d'Orsay, Paris. For more, see: Impressionist Landscape Painting (1870-1910). For an explanation of plein air landscape paintings, like those produced by Impressionist painters, see: Analysis of Modern Paintings (1800-2000). French painter famous for his genre painting of rural life.  L'Amour au Village (Rural Love) (1882) Pushkin Museum of Fine Arts. Underrated but dazzling French Neo-Impressionist landscape artist.  The Iles d'Or (The Iles d'Hyeres) (c.1892) Musee d'Orsay, Paris.  The Evening Air (c.1893) Musee d'Orsay. For more, see: Pointillism (1880-1900). One of the great figures in Post-Impressionist painting, famous for his brightly coloured Tahitian scenes.  Poplars (1883) Ny Carlsberg Glyptotek, Kopenhagen.  Lane at Alchamps, Arles (1888) Seiji Togo Memorial, Japan.  Food Day (Mahana maa) (1892) Cincinnati Art Museum.  Landscape with Peacocks (Matamoe) (1892) Pushkin Museum, Moscow. Post-Impressionist symbolist painter, founder of Les Nabis.  The Talisman (1888) Musee d'Orsay. Founder of Neo-Impressionism. Best-known for these celebrated genre-paintings/urban landscapes.  Bathers at Asnieres (1884) National Gallery, London.  A Sunday Afternoon on the Island of La Grande Jatte (1884-6) AIC. Swiss symbolist painter best-known for this masterpiece.  Island of the Dead (1880) Metropolitan Museum of Art, New York.  Sea of Mist (Mare di nebbia) (1885) Private Collection.  Morning (Mattino) (1898) Galleria d'Arte Moderna, Milan. Leading German Romantic artist; visionary painter of symbolist landscapes.  Winter Landscape (1811) National Gallery, London.  Chalk Cliffs on Rugen (1818) Museum Oskar Reinhart, Switzerland.  The Wanderer Above the Sea of Fog (1818) Kunsthalle, Hamburg.  The Sea of Ice (182324) Kunsthalle Hamburg. World-famous Dutch painter, pioneer of Expressionism.  Wheat Field with Cypresses, Saint-Remy (1889) National Gallery, London.  Starry Night (1889) Museum of Modern Art, New York.  View of Arles. Orchard in Bloom with Poplars (1889) Pinakothek, Munich.  Branches of Almond Tree in Bloom (1890) Van Gogh Museum, Amsterdam.  Wheat Field with Crows (1890) Van Gogh Museum, Amsterdam. See also: Post-Impressionism in Holland (c.1880-1920). Norwegian painter devoted to capturing the complex effects of light.  Summer Evening on the Southern Beach (1893) Skagens Museum, Skagen. Outstanding landscape painter, famous for his mastery of light/ colour.  Secluded Monastery (1890) Tretyakov Gallery, Moscow.  By the Whirlpool (1892) Tretyakov Gallery. 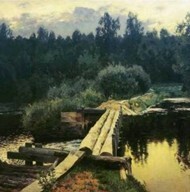  Road to Vladimirka (1892) Tretyakov Gallery.  Spring Flood (1897) Tretyakov Gallery. Versatile Russian artist, Professor at the Moscow School of Painting.  Moscow Courtyard (1878) Tretyakov Gallery.  Overgrown Pond (1879) Tretyakov Gallery. Armenian expressionist, founder of the Armenian national school of painting.  Constantinople Street: Midday (1910) Tretyakov Gallery.  Sunrise over Ararat (1923) I. Lunacharskaya Collection, Moscow. Russian Impressionist portraitist, and landscape artist.  Colts at a Watering Place, Domotkanovo (1904) Tretyakov Gallery. For more about colour, see: 19th Century Colour Palette. Foremost forest scenery and landscape artist.  Oak Grove (1887) Museum of Russian Art, Kiev.  Morning in a Pine Forest (1889) Tretyakov Gallery, Moscow.  Countess Mordvinova's Forest at Peterhof (1891) Tretyakov Gallery. For more, see: Russian Painting 19th Century (c.1825-1917). German-American artist best-known for his American wilderness landscapes.  The Rocky Mountains (1863) Metropolitan Museum of Art, New York.  Domes of Yosemite (1867) St Johnsbury Athenaeum, Vermont.  Fur Traders Descending the Missouri (1845) Metropolitan Museum of Art. American Impressionist artist; director of the Shinnecock Hills Summer School.  Prospect Park and Central Park (c.1886-90) various works, in several museums. Romantic frontier painter, member of Hudson River School.  Twilight in the Wilderness (1860) Cleveland Museum of Art. 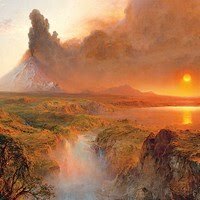  Cotopaxi (1862) Detroit Institute of Arts. English-born melancholic landescape artist, founder of Hudson River School.  American Lake Scene (1844) Detroit Institute of Arts. For more, see: Hudson River School of Landscape Painting (1825-75).  Church Procession, Spanish Steps (1883) Private Collection.  Boston Common at Twilight (1886) Museum of Fine arts, Boston. For more, see: American Impressionism (1880-1900). American tonalist painter, influenced by Barbizon, famous for his intimate, mystical scenes.  Autumn Gold (1890) Wadsworth Atheneum, Hartford, Connecticut.  In the Gloaming (1893) Private Collection. Early American Impressionist, close friend of Claude Monet.  By the River (1887) Private Collection.  La Vachere (1888) Smithsonian Museum. American Impressionist artist, influenced by Whistler and Japonism.  An Early Winter (1882) Private Collection. American Impressionist, member of the Cos Cob Art Colony Connecticut.  The Red Bridge (1895) Metropolitan Museum of Art, New York. American painter and etcher; best-known for his lyrical tonal paintings.  Nocturne: Blue & Silver, Chelsea (1871) Tate Collection, London. 19th Century landscape artist; inspired by Hokusai's Ukiyo-e prints.  Hodogaya: 4th Station of The 53 Stations (Tokaido Series) (1834) Tokyo.  One Hundred Views of Edo (1858) Brooklyn Museum, New York. Japanese Ukiyo-e artist collected by Whistler, Monet, Degas, Lautrec.  Mount Fuji in Clear Weather (c.1829) British Museum, London.  The Great Wave off the Coast of Kanagawa (1832) Metropolitan Museum. English member of the Heidelberg School; most like the French Impressionists.  Herrick's Blossoms (1888) National Gallery of Australia, Canberra.  An Early Taste for Literature (1888) Ballarat Fine Art Gallery. Arguably the greatest exponent of Australian Impressionism (1886-1900).  Lost (1886) National Gallery of Victoria, Melbourne.  The Pioneer (1904) National Gallery of Victoria. Leader of the Heidelberg School, the Melbourne Impressionist group.  Slumbering Sea, Mentone (1887) National Gallery of Victoria, Melbourne.  An Autumn Morning, Milson's Point (1888) Art Gallery of NSW.  A break away! (1891) Art Gallery of South Australia, Adelaide. The greatest Australian landscape painter; member of the Heidelberg School.  Still Glides the Stream (1890) Art Gallery of New South Wales.  Spring (1890) National Gallery of Victoria.  The Purple Noon's Transparent Might (1896) National Gallery of Victoria. Marked by the use of geometrical shapes, and new relationships between colours - and between form and space - Cezanne's later landscapes (and still lifes) exerted a major influence on Early Cubist Painting (c.1907-9). See in particular the following, as well as his later paintings of La Mont St. Victoire.  Pigeon-Tower at Bellevue (1888-92) Kunsthalle, Basel.  Bibemus Quarry (1898-1900) Folkwang Museum, Essen.  Plain in Provence (1886) Villa Flora, Winterthur, Switzerland.  Trees and Houses (1885) Musee de L'Orangerie, Paris. Co-inventor of Cubism, influenced by Cezanne's earlier "Cubist" landscapes.  House in a Garden (1908) Hermitage Museum, St Petersburg.  Houses on the Hill (1909) Museum of Modern Art, New York. It was the cubes in Braque's landscapes described by the art critic Louis Vauxcelles as 'bizarreries cubiques' - which led to the name "Cubism".  Viaduct in Estaque (1908) Musee National d'Art Moderne.  Houses at L'Estaque (1908) Kunstmuseum, Bern.  Road Near L'Estaque (1908) Museum of Modern Art, New York. Cubism had a strong influence on the urban landscapes of the American Precisionism movement, led by Charles Demuth (1883-1935) and Charles Sheeler (1883-1965). Used a less garish palette. Member of Moreau's class at Ecole des Beaux Arts.  View of Capri (1904) Private Collection. Friend of Matisse. Huge influence on the use of colour in painting.  Boats at Collioure (1905) Kunstmuseum, Dusseldorf.  Effect of Sun on the Water (1906) Musee de l'Annonciade, Saint-Tropez.  Charing Cross Bridge (1906) National Gallery of Art, Washington DC.  Charing Cross Bridge I (1906) Whitney Museum, New York.  The Trees (1906) Albright-Knox Art Gallery, New York. French painter best-known for colourful, decorative paintings.  The Pantheon and St. Etienne-du-Mont (1904) Albright-Knox Art Gallery.  Boats at Martigues (1908) Courtauld Institute Galleries, London.  Casino at Nice (1927) Private Collection. Le Havre Fauvist noted for his loose, highly coloured expressionist style.  The Seine at Paris, Pont de Grenelle (1901-4) Glasgow Museums.  Sunday at Honfleur (1907) Musee Toulouse-Lautrec, Albi. Friend of Camoin, Matisse; noted for colour-saturated landscapes, still lifes.  Landscape at St Tropez (1905) Hermitage, St Petersburg.  The Parkway (1905) Pinakothek der Moderne Munich.  Morning at Cavaliere (1906) Hermitage, St Petersburg. Impressionist specializing in watery landscapes of canals, ports, River Seine.  Le Pont-Neuf (1906) National Gallery of Art, Washington DC.  The Seine at Paris (1907) Private Collection. The most influential exponent of Fauvism and the 'Father of Modern Art'.  Luxe Calme et Volupte (1904) Musee d'Orsay, Paris.  Open Window, Collioure (1905) John Hay Whitney Collection. Colourist, noted for impastoed canvases marked by loose fast brushwork.  Champs de Ble, Restaurant at Bougival (1905-6) Musee d'Orsay, Paris.  The Blue House (1906) Minneapolis Institute of Arts. Member of Die Brucke, noted for powerful portraits, decorative landscapes.  Landscape Near Dresden (1910) Neue Nationalgalerie, Berlin.  Sailing Ships in the Harbour (1911) Westfalisches Landesmuseum, Munster. See also: History of Expressionist Painting (1880-1930). Russian colourist, founder of Der Blaue Reiter. Partner of Gabriele Munter.  The Blue Rider (Der Blaue Reiter) (1903) E.G. Buhrle Collection, Zurich.  Winter Landscape (1909) Hermitage Museum, St Petersburg.  Church in Murnau (1910) SGiL, Munich. Leader of Die Brucke, influenced by violent forms and Primitive art.  Playing, Naked People (1910) Pinakothek der Moderne, Munich.  Windswept Firs (1919) Private Collection.  Red Elisabeth Riverbank, Berlin (1913) Pinakothek der Moderne, Munich. With Schiele, the leading figure of Austrian Expressionism.  London, View of the Thames in the Evening (1926) Private Collection. The most French-like of all the Blaue Reiter painters; joyful expressionism.  Park Restaurant (1912) Kunstmuseum, Basel.  View of Tegernsee (1913) Private Collection. Co-founder of Der Blaue Reiter; noted for his very personal paintings.  In the Rain (1912) Stadtische Galerie im Lenbachhaus, Munich.  Deer in the Forest II (1914) Staatliche Kunsthalle, Karlsruhe.  Animals in a Landscape (1914) Detroit Institute of Arts. Expressionist painter and engraver, noted for bold still-lifes and landscapes.  Staffelsee in Autumn (1923) National Museum of Women in the Arts.  Misthaufen, Murnau (Dorfstrasse in Murnau) (1908) Private Collection.  Murnau in May (1924) Private Collection. Close friend of Heckel, best-known for his primitive female nudes in landscape.  Two Women in the Reeds (1922) SGMA, Munich. Spontaneous but strident artist; quintessential German Expressionist.  Young Men From Papua (1913-14) Staatliche Museen, Berlin. Colourist, best-known for woodcuts, and a forceful, angular panting style.  Village House with Pastures (1907) Nationalgalerie, SMPK, Berlin.  Farmhouse in Dangast (1910) Neue Nationalgalerie, Berlin.  Mud Flat at Low Tide (1912) Private Collection. Californian abstract expressionist painter noted for 'aerial' landscapes.  Cityscape I,(Landscape No. 1) (1963) San Francisco Museum of Modern Art.  Berkeley No. 52 (1955) National Gallery of Art, Washington DC.  Ocean Park No 79 (1975) Philadelphia Museum of Art. Celebrated surrealist painter of the Australian bush.  Sofala (1947) Art Gallery of New South Wales, Sydney.  Snake Bay at Night (1959) Tasmanian Museum and Art Gallery. See also: Australian Modern Painting (1900-60). Founder of colour stain painting, a style well suited to abstract landscapes.  Provincetown (1964) Private Collection. English abstract colourist painter; member of the St Ives artist group.  Boats at Night (1947) Tate Collection.  Harbour Window with Two Figures: St Ives (1950) Tate Collection. For more, see: St Ives School (1939-1960s). Yorkshire-born Pop artist, painter, supreme draughtsman and photographer.  A Bigger Grand Canyon (1998) National Gallery of Australia.  Winter Timber (2005) Private Collection.  Woldgate Woods (2006) Private Collection. Australian outback painter, best-loved for pictures of bushranger Ned Kelly.  Burke and Wills Expedition (1948) Sidney Nolan Trust.  Riverbend I (1965) Australian National University Art Collection.  Fremantle Series (1979) Australian National Gallery, Canberra. Australian painter noted for his landscape paintings and portraits.  Sapling Forest, Cherry Plum Blossom (1984) Private Collection. Russian-born abstract painter associated with Lyrical Abstraction.  Seaside Railway in the Setting Sun (1955) Private Collection. Semi-abstract landscape artist, portraitist and subject painter.  Welsh Landscape with Roads (1936) Tate Collection, London.  Green Tree Form: Interior of Woods (1940) Tate Collection, London. One of the most influential Australian artists of the mid-20th century.  Dry Creek Bed, Werribee Gorge I (1977) National Gallery of Australia.  Drifting Smoke (1981) National Gallery of Victoria, Australia. Maine painter responsible for one of the most poignant works in history.  Christina's World (1948) Museum of Modern Art, New York.  For more about landscape paintings around the world, see: Homepage.